The postcard shot: Yellow Water Billabong, Kakadu (photo: Parks Australia). So many options, so little time… choosing which tours to do in Kakadu can be bamboozling because they all sound so great, so we’ve taken the hard work out of having fun with this cheat’s list of the best ways to see the best bits of Australia’s biggest (and best) national park. 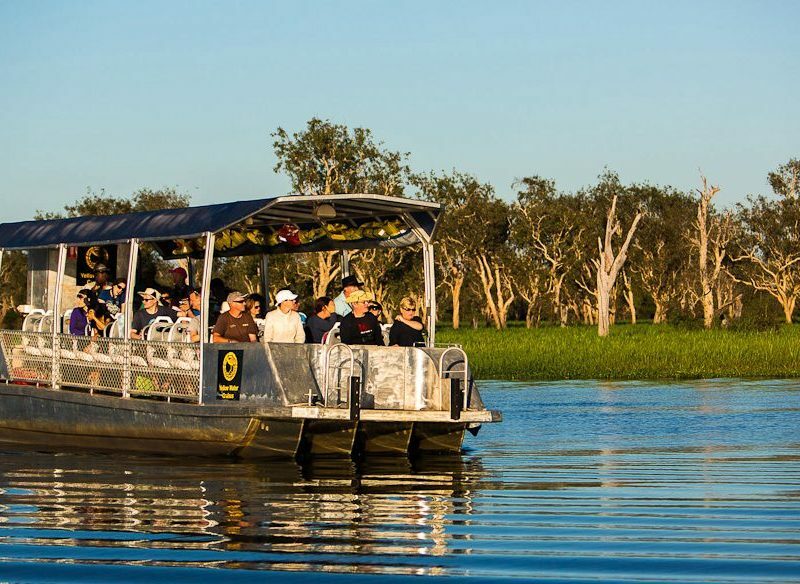 Which Kakadu boat cruise to choose? 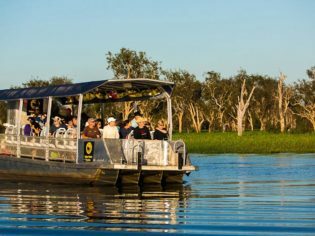 To really get to know Kakadu’s wetlands you really have to get out there… here are the pick of the cruise tours in the national park. This iconic Kakadu tour operates year-round out of Cooinda, which means the landscape is ever-changing, depending on the season. A guide leads the Guluyambi Cultural Cruise, East Alligator River, Kakadu (photo: Megan Arkinstall). From a small dock not far from Ubirr, you will venture to the Arnhem Land side of the East Alligator River on this small covered boat cruise. This Aboriginal reserve is otherwise inaccessible to tourists, unless you have a permit. Expect to see some impressively large crocodiles, sandy beaches, ancient rock art and a spear-throwing demonstration. You might think most of Kakadu’s action is on the ground, or out on (or under) the water, but you get a whole new perspective of the floodplains and escarpments from the air, especially in the wet. If you’re a photographer, a helicopter flight offers the ultimate in flexibility. 70-minute west season flight that includes Jim Jim and Twin Falls, as well as shorter flights . Offers a range of flights including a two-hour fixed-wing aircraft tour. For a full day of activity (almost 10 hours) take this indigenous-owned excursion that operates year-round (departing from Cooinda Lodge). In the dry season you’ll head for Jim Jim and Twin Falls, which plunge off the escarpment, making them two of the most spectacular sights in Kakadu (though you’ll discover early on why you need a 4WD vehicle to get there). There’s a maximum of 16 passengers (www.kakadutourism.com/tours-activities/yellow-water-cruises/). Several day tours as well as a magnificent ‘safari lodge’ called Hawk Dreaming, the Kakadu Cultural Tours are locally owned and run with access to exclusive sites in Northern Kakadu and Arnhem Land. They operate under three major tours, the exceptional day tour into Western Arnhem Land called the Arnhemlander, the East Alligator River cruise mentioned above and the Hawk Dreaming camp. Sab Lord is legendary in the NT as a classic “outback character. Sab’s Lords Safaris take day and multi-day tours into ‘his’ Kakadu. His family owned and operated the last pastoral land that later became part of Kakadu National Park and has maintained his connection to the land and people. In the dry season (May–October) you can take a seven-hour wildlife safari and fascinating Aboriginal cultural tour in an open 4WD each afternoon (departing from Cooinda). There are plenty of 4WD tour companies that take a little longer to enjoy Kakadu, or combine it with other wonders around the area such as the Cobourg Peninsula and Arnhem Land. Charter North has over 20 years of Kakadu experience and specialise in tours for families and special interest tours such as indigenous culture and rock art, photography. You can book a one, three, four or six day tour. Brookes Australia calls its Kakadu multi-day tours ‘civilised adventure’; every night is spent ensconsed in a hotel if you’re not interested in that camping palaver. Venture North offers a five-day natural wonder-a-thon that takes in billabongs, swims, walks and art in Kakadu as well as the Cobourg Peninsula and Arnhem Land. Sugarbag Safaris is a small, local outfit run by encyclopaedic Brolga Award-winning guide Hamish. His five-day Kakadu, Katherine and Litchfield tour includes a wildlife cruise and camping under the stars in a custom swag. World Expeditions offer six-day trips just like this one, inclusive of all meals and semi-permanent tent accommodation. Willis’s Walkabouts run trips of varying lengths that explore the back country and are led by Kakadu die-hard Russell Willis, who’s been trekking the park since 1974. Gecko Canoeing run six-day walks in southern Kakadu, starting at Koolpin Gorge and ending at Twin Falls. Park Trek run nine-day walking tours that cover Kakadu and Nitmiluk National Park. Accommodation is provided in resorts, cabin and units. Auswalk tours stay at lodge or homestead rooms with ensuites. They explore Kakadu, Katherine Gorge, Litchfield and Mataranka thermal pools over nine days. One of the best things about Kakadu is that its most popular walking trails are staffed by park rangers who, during the dry season, give guided tours for free. The tours are part of Kakadu’s interpretive program, which includes guided walks, slideshows in certain campgrounds, art site talks, and cultural demonstrations like pandanus weaving and indigenous painting techniques. The program schedule is changed each dry season, and you can be sure that, at the very least, there will be guided walks at Kakadu’s two most popular rock art sites (Nourlangie and Ubirr). You can find updates to the program at Parks Australia or by phoning Bowali Visitor Centre (08 8938 1120). East Alligator River might reward the keen fisherman with a Barramundi. Kakadu, NT. When the wet season displaces millions of litres of water, which thunder through rivers and floodplains before receding, Kakadu is a fishing hotspot. The secret is the ‘run-off’, a sweet spot on the calendar (mid-March to end of April) straight after the wet, when water drains back out of the floodplains into the rivers, and barramundi (alongside other fish) collect in certain areas accordingly, including Yellow Water, South and East Alligator River, Sandy Billabong, and Two- and Four-Mile Holes. Being a national park, fishing requires a licence, but if you’re not licensed (or don’t want the hassle of hiring your own boat and 4WD), you can join a local fishing tour, or charter your own boat. Based out of Jabiru, Kakadu Fishing Tours runs a charter service that can go anywhere you like. From $240 per person for a half-day, including refreshments. Based in Cooinda, virtually on top of iconic Yellow Water, Cooinda Lodge only offers fishing tours through the famous billabong. $150 per person including all fishing gear and cold drinks. While not in Kakadu National Park, Bamurru Lodge it is located just nearby and turns exclusively into a dedicated barramundi fishing lodge during the run-off.